Plot: A group of scientists venture into an anomaly in which evolution has taken a strange course. A work of stunning visuals dealing in subject matters that will make your head spin and your eyes glisten, Annihilation is sci-fi at its most gloriously challenging best. 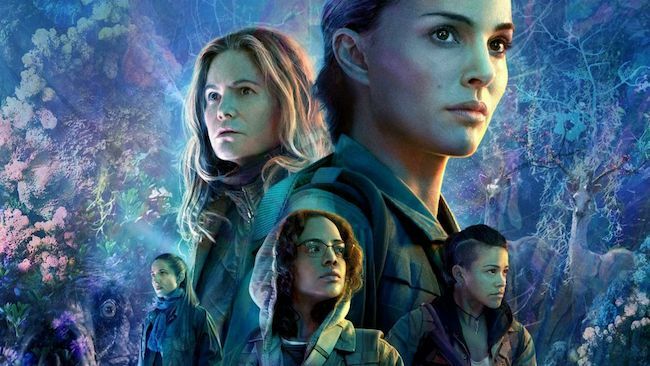 Annihilation should have been seen in cinemas. It is one of the most visually cinematic films in recent memory. But a paranoid studio head saw to it that what he considered to be an overly intellectualised piece of sci-fi would only been seen on the Silver Screen in the US and China. Everywhere else gets it on Netflix. That is not necessarily a bad thing. Provided you have a decent sized TV and audio that will shake your neighbours glasses in their cupboards you’re probably okay. On the flip side, anyone who wants to see Annihilation can see it. And you should. Off the back of his eye-popping debut Ex_Machina, director Alex Garland returns to the deep thinking form of sci-fi that made Kubrick smile with pleasure and Andrei Tarkovsky stare deeply into the cosmos of your retina. That might sound hyperbolic but the praise is real. Annihilation is a film with such gravity it will unquestionably draw the entire genre towards it like a sun just waiting to create life in the cinematic solar system surrounding it. 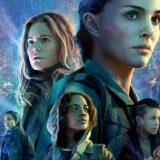 When her military husband, who has been missing for a year, suddenly returns home biologist Lena (a stoically conflicted Natalie Portman) is drawn to Area X. Within Area X is The Shimmer, a glassy filmed area that is slowly expanding. Determined to find out what happened to her now dying husband Lena enters The Shimmer with psychologist Dr. Ventress (Jennifer Jason Leigh), paramedic Anya (Gina Rodriguez), physicist Josie (Tessa Thompson) and geologist Cass (Tuva Novotny). Once in The Shimmer the team soon discover their memories are not what they seem, time moves differently and our world within has evolved into something both familiar and alien. Based on the book by Jeff VanderMeer Annihilation is one of the most thought-provoking and wondrous films in recent memory. You know that feeling of insignificant existentialism you get when listening to Professor Brian Cox tell us how we’re all born from the tiny molecules that were shot into the galaxy after the Big Bang? This is the filmic equivalent of that. Like Ex_Machina, Annihilation is an essay in what it means to be human. But in typical Garland fashion it refuses to just stop there. Instead it’s themes tackle everything from memory, grief, trauma, love, and what makes us, us. All shot through a sci-fi infused emotional lens. At one moment it can be a straight-up sci-fi horror, the slow-burn of Alien, the next it can be a reflective, visual kaleidoscope akin to Under The Skin. The genius of the film, and also the reason that presumably the aforementioned studio head ran scared, is it refuses to conform or, like much within The Shimmer, be just one thing. As such it keeps you hooked, tangling on the mystery, picking up little clues here and there as to what it all means. It poses big questions, it demands a lot of its viewer, and then, like all great science fiction, it leaves the nuances up to the audience. Imagine if Terrence Malick decided to make a sci-fi and you’re somewhere close to the masterpiece that is Annihilation.